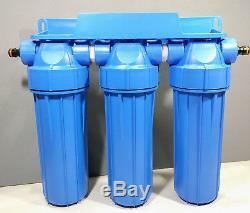 3 Stage HMA High Flow Water Filter. 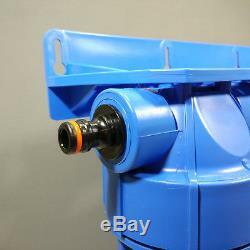 3 - Stage water filter housing with male garden hose connector. In blue sump, which protect filter cartridges against the phenomenon of algae growth in case the system is installed in a sunny location. WWBH activated carbon block cartridge. FCCA coconut shell granulated activated carbon (GAC) cartridge. Removes sand, rust, silt and other sediments up to 1 micron. Removes levels of Chlorine, Organic Compounds, Pesticides, Herbicides, Trihalomethanes and Volatile Organic Compounds (VOCs). Carbon GAC filter reduces levels of Chlorine, Organic Compounds, Pesticides, Herbicides, and also reduces levels of heavy metals in the water and balances pH. Mains water contains Chlorine, Chloramines and Heavy Metals that are not suitable for a healthy and balanced fish pond. Aquafilter De-Chlorinators are used to remove harmful chlorine, Chloramines and other impurities from mains tap water when refilling a pond. This is very important as failure to do this can result in fish health problems and it also adversely affect the growth of beneficial bacteria in all filters. The Aquafilter De-Chlorinator simply connects in-line to a hose pipe with standard hose fittings. The filter removes the toxins in tap water prior to it coming into contact with your fish and filters. To remove Chloramines its important to have a long contact time with the activated carbon filter, the longer the water takes to pass through the filter, the greater the benefits of the purification system. A flow rate of 10 litres per minute should adequately remove toxins and the filtered water can then safely be added into your pond or filtration system. If you want to keep your pond water healthy, a high quality de-chlorinating pond filter is an essential investment. WRAS approved plastic housing, bracket and stainless steel screws. Quality NSF approved sediment filter, carbon block and GAC cartridge. Made of safe, food grade materials. Removes chlorine, its derivatives and organic substances. Excellent filtration at small pressure drops. 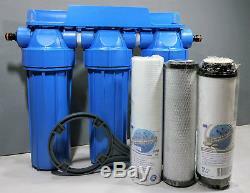 Filter Life: 3-6 months 15,000 litres (depending on feed water quality). Connects to a garden standard hose. Clean and "no hassle" water changes. Simple to Use, Ideal for First Fills. Maximum operating pressure: 6 bar (90 psi). Goods ordered before 1pm will be sent out on the same day. We provide invoices with VAT separately displayed. The item "3 Stage HMA High Flow Water Filter KOI Pond Dechlorinator Chlorine Removal" is in sale since Saturday, January 20, 2018. This item is in the category "Home, Furniture & DIY\DIY Materials\Plumbing". plus" and is located in Bridgwater. This item can be shipped to United Kingdom, Austria, Belgium, Bulgaria, Croatia, Cyprus, Czech republic, Denmark, Estonia, Finland, France, Germany, Greece, Hungary, Ireland, Italy, Latvia, Lithuania, Luxembourg, Malta, Netherlands, Poland, Portugal, Romania, Slovakia, Slovenia, Spain, Sweden, Australia, United States, Canada, Brazil, Japan, New Zealand, China, Israel, Hong Kong, Norway, Indonesia, Malaysia, Mexico, Singapore, South Korea, Switzerland, Taiwan, Thailand, Chile.